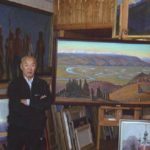 Born in 1928 in Ergit nasleg of Yakutia, Afanasy Osipov was People’s Artist of the RSFSR, Honored artist of Yakut ASSR, member of the USSR Union of Artists since 1956. 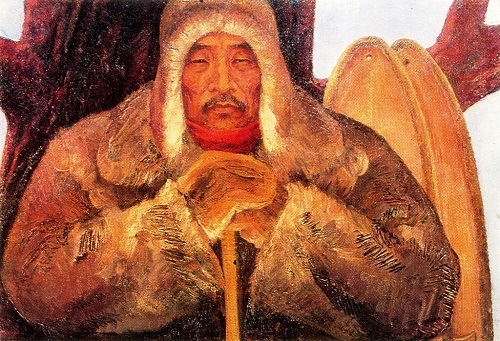 The winner of the Yakut Komsomol Award, and corresponding member of the USSR Academy of Arts. 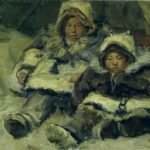 In 1955 he graduated from the painting department of the Moscow State Institute named after VI Surikov, which he entered in 1949, after finishing Art School at the same institute. 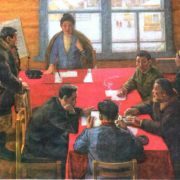 He was awarded the Order of Red Banner of Labor, the medal “For Valiant Labor” in commemoration of the 100th anniversary of Lenin’s birth. 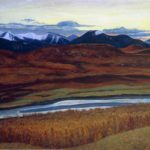 Noteworthy, in the sixties of the last century, in Yakutia has formed a creative group of leading painters. 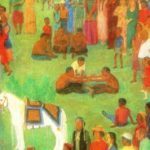 For the next decade they created many paintings that enriched the perspective of the modern fine arts of the republic. 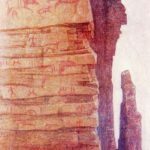 They widened the theme of the native land, which now sounds in a new way, deeper and fuller, often in close conjugation with the past and the future. 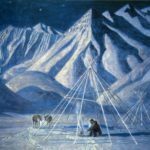 One of the most significant artists of the Soviet period was Afanasy Osipov, author of many cycles of the plot and thematic paintings, portraits and landscapes. 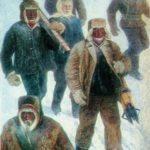 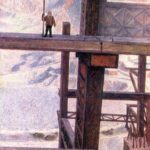 The works of Osipov have given detailed picture of life of the Soviet Yakutia. 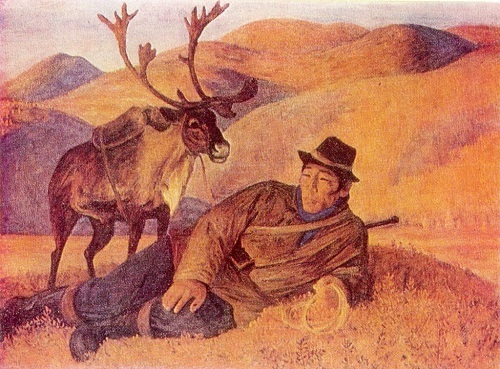 Early paintings are mainly devoted to the Yakut tundra that Osipov depicts with a leisurely inquisitiveness and accuracy. 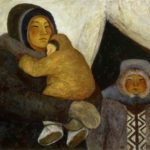 By recreating the colorful features of nature and life, weekdays and holidays of Arctic, the author keenly noticed the new features in the character of the northern reindeer herders and hunters. 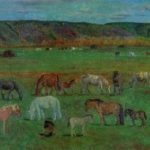 Exhibitions: Art of Ykut republic (since 1955), the fourth-Union exhibition of theses of students of art universities of the USSR (1955, Moscow), fine art and folk art of YASSR in Moscow (1957), Fine Art of YASSR in Moscow (1963), mobile exhibition of Yakut fine art in the cities of the RSFSR (1963-1964), “artists of Yakutia”, dedicated to the 50th anniversary of the Yakut ASSR (1972, Leningrad, Ufa), works by artists of Yakutia in the Tuva Autonomous Soviet Socialist Republic (1968, Kyzyl), works by artists of Yakutia in the Magadan region (1971, Magadan), “the Soviet Far East” (1964, Khabarovsk, 1967, 1974, Vladivostok, 1969, Ulan-Ude), the works of artists of the RSFSR autonomous republics (1971, Moscow), “artists of the Urals, Siberia and the Far East” (1971, Moscow), the works of artists of RSFSR (1955, Moscow), “Soviet Russia” (1960, 1965, 1967, 1970, 1975, Moscow), the Republican “In the home country” (1972, Moscow), the All-Union, dedicated to the 50th anniversary of the Great October Revolution (1967, Moscow), the All-Union “Physical Culture and sport in the visual arts” (1968, 1971, Moscow), the All-Union 1971 (Moscow), the All-Union “USSR – our Homeland” (1972. 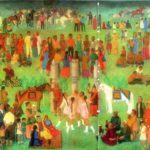 Moscow), the All-Union “Glory to labor!” (1976, Moscow), works by members of the USSR Academy of Arts (1973, 1976, Moscow), International “Physical Culture and Sport in the visual arts” (1972, Munich), “Soviet Socialist Siberia” (1973 Tokyo), “Artists of Yakutsk (Vasiliev, A. Munkhalov, Osipov)” (1971, Moscow), personal (1978-1979, Moscow, Leningrad, Prague, Bratislava, Ulaanbaatar). 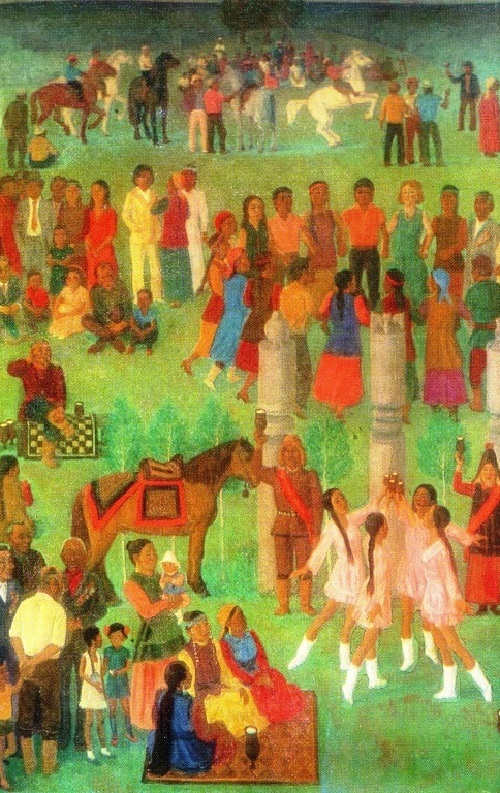 Major works: “The expulsion of shaman” (1957), “The Scream” (1959), “The Feast of herders” (1964), “Kolkhoz” (1967), a triptych “Gray Vilyui” (1969), “Honored coach of the USSR D. Korkin with students” (1971), “Building a house in Mytakh nasleg”(1971), a triptych “In the land of the ancestors” (1971), “Group portrait of Yakutia writers”(1974), a triptych “In native land” (1975), “Horse breeders (White nights)” (1975), Group portrait of Buryat artists (1976), “Kharaulakh ridge” (1976), series “Landscapes of Patom” (1976), series of landscapes “May in tundra” (1977).